In the realm of luxury automobiles, there are plenty of options at your disposal that all tout the kind of elegance and grace that so many of us desire. The pure feelings of sophistication and confidence that come from taking your top-tier model on a night drive through the city are unbeatable, feelings that the 2018 Alfa Romeo Giulia and 2018 Infiniti Q50 are happy to propagate. Both of these high-class sedans can give you stellar interior comfort with plenty of power to spare under the hood. But how do they match up in a head-to-head scenario? We invite you to join Alfa Romeo of Glendale today as we take a look at how the 2018 Alfa Romeo Giulia and 2018 Infiniti Q50 stack up against each other. This comparison is sure to be eye-opening, and we think you'll end up with a new favorite vehicle, so come on in today and check these two luxury kings out! There's no debate over the worthiness of the 2018 Infiniti Q50 to line your driveway and project the kind of status that you seek – its Active Lane Control and Forward Emergency Braking systems aren't provided by the 2018 Giulia, but if you're looking for a more race-ready, adrenaline-laced experience, the latter is a vehicle you should keep your eye on as it drives past. With a carbon fiber driveshaft and DNA Drive Mode Selector leading the way, every aspect of your journey is carefully optimized in ways that the Q50 can't equal. Add this to an 8.8-inch widescreen interface, and a standard Blind Spot Monitoring system, you can keep in control of your drive and the behaviors of all those around you. Plus, with a bold, athletic exterior styling, the 2018 Giulia represents one of the most comprehensive (and powerful) sedans on the market. 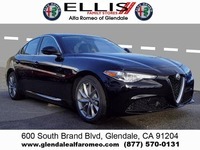 We don't blame you if you've had your eye on the Giulia for some time and are interested in scheduling a test drive. Be sure to contact our sales team today and get behind the wheel at your earliest convenience. No matter whether you'd like to take the Base Giulia or its top-level Quadrifoglio trim for a spin, we're happy to help you out!